The LACCD BFSA supported the Department of Pan-African Studies’ 7th Annual Forum celebrating 45 years of its program. 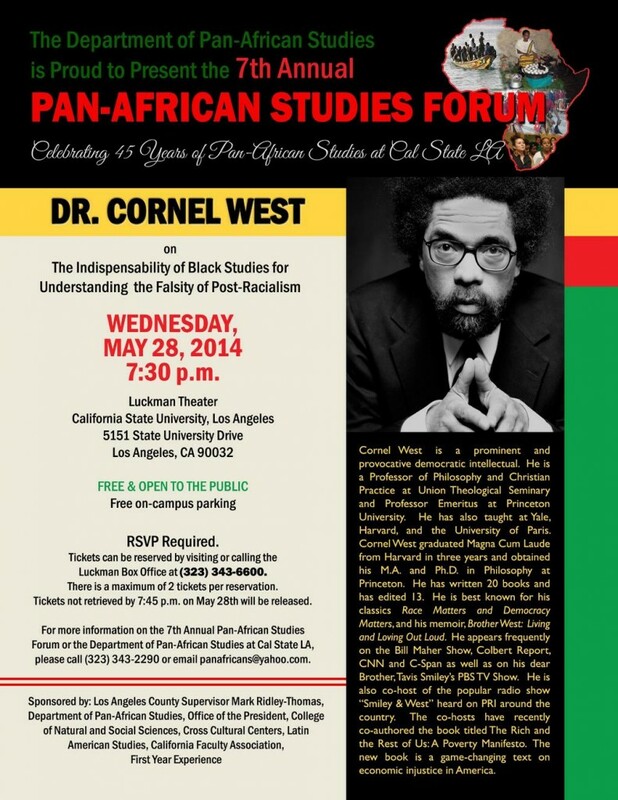 The theme of the program was “The Indispensability of Black Studies for Understanding the Falsity of Post-Racialism.” Dr. Cornel West was the featured speaker. CSULA’s Pan-African Studies department has been involved in a recent struggle to make their courses part of the General Education program. Read more here: http://www.fightbacknews.org/2014/2/2/fight-black-chicano-studies-continues-csula. In support of the CSULA’s Pan-African Studies department and of the scores of students who will eventually attend the university, the LACCD BFSA donated $500 toward the endowment of the Pan-African Studies Department’s Dr. C.R.D. Halisi Scholarship. The scholarship provides support to outstanding Pan-African Studies majors each year…those who reflect the vision, intellect, commitment and humanity of former department head, Dr. Halisi, who passed away in 2013. For a glimpse of Dr. Cornel West’s talk, watch the short video and photo stream below by notable Los Angeles based photographer, Leroy Hamilton.